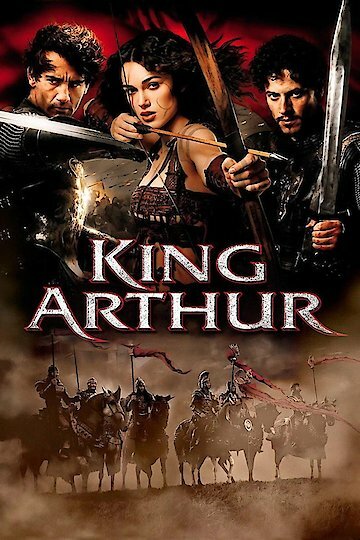 King Arthur played by Clive Owen is an 2004 action/adventure movie. The movie is surrounding the remainder of the king's soldiers,Lancelot, Tristan, Dagonet and Galahad who are all expecting to be discharged from the army. On the day of their discharge they are required to do one last mission, one that might cost them their lives. Their mission is to save a Roman Family(the family of Marius) from the capture of the Saxons. The mission goes successfully and they save the family from the Saxons. Along the way back home a girl named Guinevere tells Arthur several fairly tales about his life. She reveals to Arthur that he is half Celt on his mom's side and she also takes him to visit her father. At first he is surprised but happy to see Merlin, who reveals to him the nature of his mother. He is surprised to know that he is of the same blood as Merlin and his mother was as well. Merlin suggest a merger between the knights and Moad(Merlin's blood line) against the invading Saxons. On the road home Marius betrays everyone and is shamed by his entire family, Guinevere eventually must use one of the soldiers bows to kill her father. Returning from his adventure Arthur is told by Tristian about the impending attack by the Saxons. The Knights face the Saxons while the refuges flee to safety. They fight on a ice covered lake and are almost defeated by them, when Dagonet runs to the middle of the ice and splits it open with his axe. The split causes many of the Saxons to drown in the ice water, but at the cost of Dagonet's own life. The soldiers pay tribute to the fallen soldier and press onward to the final climatic battle. The soldiers fight the Saxons with the Woad's help. Though Arthur wins the war his faith is shaken in the Roman belief, now that he has found out that its is all rubbish. King Arthur is currently available to watch and stream, buy on demand at Amazon, Vudu, Google Play, iTunes, YouTube VOD online.